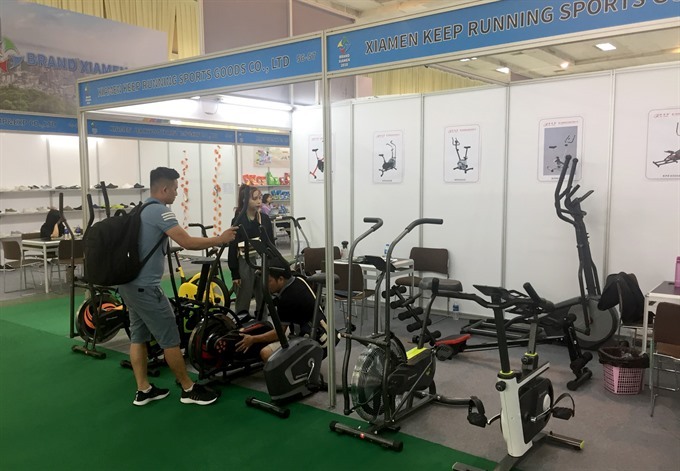 HÀ NỘI — The Việt Nam Sport Show 2018 kicked off in Hà Nội yesterday, featuring over 5,000 products from 120 domestic and foreign exhibitors. Speaking at the opening ceremony, Vương Bích Thắng, general director of the Việt Nam Sports Administration, said that it was the only exhibition in the country that delivered a message of connecting domestic and international sports firms in a business network. According to Trịnh Xuân Tuấn, deputy director of the Việt Nam National Trade Fair and Advertising (Vinexad), the organiser of the event, equipment for professional and individual sports, multi-functional gym systems, swimming pools, franchises, vitamin supplements, health index tools, and sports fashion were on display on a site of over 3,000 square metres. Other activities such as a powerlifting, crossfit, stress workout, kickboxing, fencing, Muay Thai, dance, bodybuilding and yoga demonstrations would also be on show for visitors. The event features big international names such as SODEX SPORT, the exclusive sponsor for the exhibition, and other major brands such as Mizuno, Delta, Anta, 361 Sport, Alzado, Attivo and Bigfun. Other Vietnamese names also join the event, like ANC Việt Nam, Động Lực, APACS Việt Nam, BIGFUN Leisure Toys and Sports Việt Nam, Hai Water Sport, Long Long Chemical, Trung Kien Sport, Vietyacht and Umove. In order to offer more effective co-operation opportunities, Vinexad co-operated with the Vietnam Textile and Apparel Association (Vitas) and Xiamen Huyuan Expo Co Ltd to organise a matching programme "Xiamen Essence Brands 2018” to promote partnerships among nearly 30 Chinese firms from Xiamen Province. Zhiwei Chen, general manager of Wish Sporting Goods, told Việt Nam News that his company had been distributing goods in Việt Nam for more than 20 years. “Việt Nam is a relatively developed market, and we hope to build a factory here. Labour costs are cheap and we can export our products to neighboring countries,” he said. Lin Shu, director of Xiamen Keep Running Sports Goods, said that his company started selling goods in Việt Nam in 2015 and they have six agents in the country with annual turnover of about US$1 million. Linda Huang, senior international business development manager of Hongxing Erke Industrial Co, said her company had been developing in Việt Nam for more than 10 years.